Graham Hague - The Hurricane Jumpers. In March of 1889, three powerful nations congregated their warships in a tiny bay on the north coast of a small island in the Pacific, and began threatening each other with outright war. The Pacific Fleets of the German Imperial Navy, and the United States Navy, stood face to face with each other and prepared to commence hostilities. A British man-of-war was also present to protect British interests. But before a shell could be loaded to a cannon, a terrific storm, the like of which had never been seen before in the islands, crashed onto the bay, and pounded the vessels with gigantic waves, incessant rain, and hurricane force winds. The waves were by far the greatest any resident of Apia Bay town could recall seeing before, and none of the ships, the pride of their respective fleets, stood much chance of survival. But as those vessels around him were thrown onto the reef, grounded on the shore, or simply disappeared under the waves, HMS Calliope's captain Henry Coey Kane decided on a dangerous and terrifying gamble: he would cast off his anchors and holding gear that were only just keeping his vessel off the reef a few feet astern, and with full steam on, trust his engines to force the ship through the staggering seas, against the gale, past the other ships crowding the port, and out into the "safety" of the open sea. At the time it was considered one of the most dramatic and astonishing acts of seamanship ever attempted. The main part of this web-site goes into greater detail about the storm, please click this link to get started. Scaramouche, aka Graham Hague, has self-published a book about the 1889 storm at Apia, Samoa, HMS Calliope, his great-grandfather who was a Petty Officer on HMS Calliope, the Germans and Americans present and so on. It details the people who were there, including some of the crews of the American warships: US Ships Vandalia, Trenton and Nipsic, and the German SM Schiffs Adler, Olga and Eber. It also gives a few details about people living in Apia, Samoa at the time. Naturally, it goes into far more detail than does this website. Take a quick look at a preview containing some extracts: CreateSpace Preview. 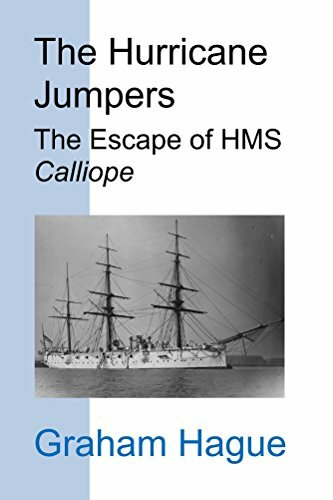 The title "The Hurricane Jumpers" is the nickname given the ship (actually, the "Hurricane Jumper") on her successful escape from the storm. I thought it should equally apply to the people who were also involved. The book opens with the early history of my great-grandfather in the Royal Navy up to joining HMS Calliope, a history of the ship, a brief explanation of the politics in Samoa that caused so many experienced ship captains to ignore the weather signs and stay in the tiny harbour of Apia, an account of the two awful days of the hurricane, the aftermath, and Calliope's return to England. I have researched as much history of the men who were present as I possibly could, officers and seamen, of the British, German and American nationalities, plus a few Apia residents and natives. I have listed the names of as many of the people, and whether they survived or perished, as I have found data for, or had visits by family descendants to this site who shared their stories. Amazon.co.uk United Kingdom Paperback and Kindle e-Book (for phone and tablet, NOT e-reader). Kindle: £2.41; Paperback: £10.97 (February, 2018 prices. Please visit the site to check latest prices. Currently free delivery in UK but check first!) Two reviews posted. Bookfinder.com Europe & World Paperback only. Some of the quoted prices are RIDICULOUS! I have seen over £114, but please don't pay more than £15. And the Amazon links are the cheapest, or direct from me if you are in the UK. Although some prices on Bookfinder might appear cheaper, make sure you check any postage costs. Direct from me! United kingdom Paperback version. Ideal for UK purchasers, as the postage is less, and I am selling CreateSpace-member-price copies which leave out the CreateSpace profit margin. The drawback is that I am only set up to accept a standard bank cheque (not Pay Pal or anything) and I know some people are averse to sending a cheque to an unknown supplier. I can only say I am an honest person, and I will send you a book! Because I am more concerned with spreading the story than making a few million, I have priced the copy direct from me as covering my costs of obtaining the copies and the UK postage only. The price will be revised as and when the costs to me change. As of October, 2018, the cost direct from me is £9.50 which includes UK mainland postage and packing (Royal Mail 2nd Class Standard delivery 2-3 working days). As of October 2018, this is about £1.50 cheaper than Amazon UK. Order it by using my contact form. Please read the notes on the form regarding purchasing the book. Please note I will only sell direct to UK purchasers, since anyone purchasing from elsewhere is advised to do so direct from Amazon which will be cheaper due to the postage cost. Since I made a revision to the book, the Kindle version is no longer available for e-readers, only phone or tablet. A friend purchased a Kindle version and is reading it on her phone. I couldn't possibly do it. She has to enlarge the page so the font is readable, which makes the phone a tiny window in the top left corner of the page, then she scrolls sideways to read the full line, then back to continue reading the next line. Ugh! If you are thinking of downloading it to read on a phone, my advice is DON'T! But I am disappointed that it is no longer available for e-reader, and will investigate why in the hope of changing that. I have no idea why the restriction has been imposed, the revision was hardly anything major. The Kindle price has also increased, again I shall try and find out why with a view to getting it back to the original price. This may be simply due to Brexit or something! Everything else seems to be laid at that door. In the links above, I list two reviews. Both are very positive, but I should warn you that the first was posted by my cousin, and the second by a friend. So although I begged them to be honest in their comments, and they have assured me they were, I suppose you will want to be a little sceptical about them. I wouldn't mind if you read the reviews yourself and then decide whether they seem genuine. If you do buy a copy (and many thanks! ), and if you enjoyed reading it, please leave a review at the site from which you purchased it. I realise this means that if you didn't like it, you can leave a bad review; but as I am asking people to spend their hard-earned cash on it, I must be prepared to take the rough with the smooth. Hopefully, there won't be too much rough!